If the Big Word Project is just a clever way for two incredibly smart dudes to make a ton of money, then I wouldn’t be the first to say it’s working. It reminds me of the genius behind the Millior Dollar Homepage, except that with so many words in the english language, these guys stand to make a whole lot more money. The Big Word Project has been set up by Paddy Donnelly and Lee Munroe, two Masters students from Northern Ireland, who are exploring what different words mean to different people. 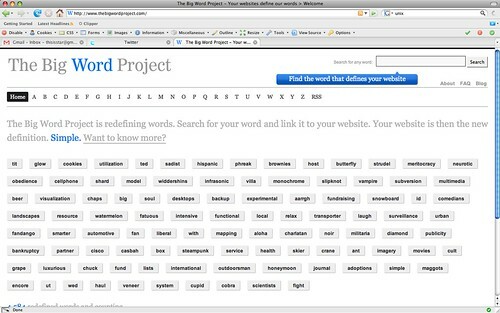 The project allows you to purchase a word from our list to represent your site. Your site will then represent this word in our list and when people click on it, they will be taken to your site. The project is aimed at changing definitions and creating a new tapestry of words, meaning altogether different things. I immediately tried to buy the word “star”, but someone else beat me to it. So what word did I actually buy? I was shocked that it was available. Have any of you bought a word? As I type this I am restraining myself from buying more. Thanks for blogging about the project and getting some words! I just purchased she and nom (in the nom nom nom delicious sense). I just bought “her” .. I’m amazed that it was available! I just saw this!!! Aww, you bought Nubby! Does this mean that you own my digital soul?